Christmas morning I got an email saying my mom had sent me a subscription to Real Simple magazine. So I clicked the link and by the time I clicked back, lo and behold there was another message. Saying that my sister and brother-in-law had sent me a subscription to … REAL SIMPLE magazine!! WOW! I must be the luckiest woman ever! I’ve gotten three issues so far and must say Real Simple is quite a spiffy mag. With lots of good tips and practical advice, it almost makes me want to clean. So far I have just looked at the photos of other people’s nice clean homes, but then again, I’m a pretty hard sell. Today’s extraordinary salt free side was adapted from this Real Simple recipe. I’d never made a baked risotto before, but now that I have I don’t want to go back to stove top stirring. Talk about EASY! You just toss everything together, pop into the oven and bada bing – it’s done. And talk about DELICIOUS. 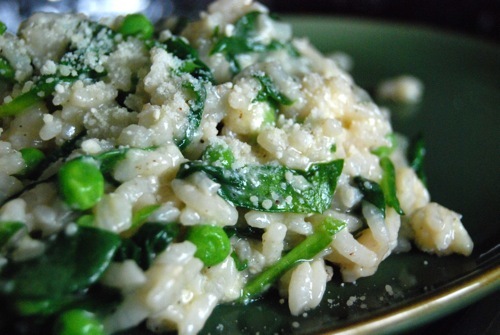 There’s something magical about the combination of flavors and textures in this risotto. Even though it’s super low in sodium, the wine and broth and cheese lend so much *taste* and that creaminess keeps you coming back for more. For those concerned about the sodium in the Parmesan, simply reduce the amount of cheese or eliminate it altogether. It’ll still be every bit as yum-tastic. Really! 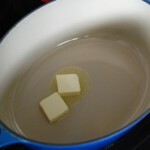 Melt the butter in a Dutch oven over medium-high heat. Add the chopped shallot and freshly ground black pepper to taste. Cook, stirring, until softened, about 3 minutes. 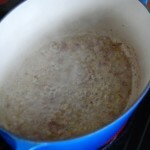 Add the wine and cook, stirring, until almost evaporated, 2-3 minutes more. Add the broth and rice and bring to a boil. Once boiling, cover the pot and transfer to the middle rack in the oven. Bake 20 minutes, until the rice is tender and creamy. Remove from oven and add the peas, spinach and grated Parmesan. Stir well to combine. Season with additional ground black pepper to taste. Serve immediately. This entry was posted in Side Dishes and tagged Real Simple. Bookmark the permalink. Dutch oven action! Yes! I really LOVE peas, so this looks fantastic to me. Who’s adding salt to frozen peas, though?! Why can’t anything just be natural? I should post a photo of one of my disgusting TV dinners so you can compare our culinary talents, Dishy! It would be hilarious! Sad, but hilarious. I’m actually on my way out to gather the needed ingredients to make this dish for tonight’s dinner! Thanks for being my inspiration. Katie – you’d be surprised how many frozen vegetable have “additions” of one kind or another. A reminder to always check labels!! Inky, I am waiting for that frozen dinner photo! Better yet, whip something up in the kitchen and impress us all. Rob, you are TOO Sweet. Hope you enjoyed a magnificent baked risotto this evening. Me? I am fighting off a gruesome virus.. Wish me luck!! We had hideous winds & rain storms along with power outages the day you posted, so I didn’t see this until the next day. This dish inspired me, though. 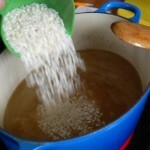 As soon as the weather settled down a bit, I went out shopping and bought a bag of arborio rice. I bought a couple bunches of fresh asparagus too and will use them instead of the peas. That will be dinner tonight. I can hardly wait. Shambo, I seriously hope that spate of bad weather has gone on its way (ne’er to return) – can’t wait to try your asparagus version – it sounds DELICIOUS! 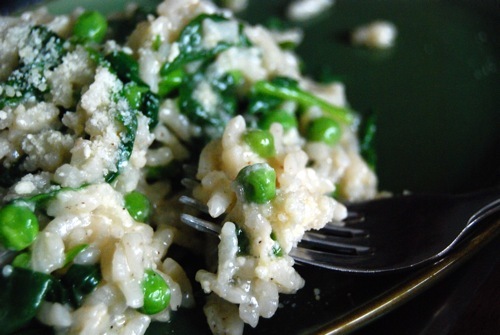 The risotto was wonderful. I cut the asparagus in 1 inch pieces and par-boiled them for a few minutes before adding them at the end. I didn’t use wine but added about 2-3 tbsp. of lemon juice at the end too. That was our meal, no meat chicken or whatever. And I even have some left over. I know it’s frowned upon, but I will reheat it as a side dish for tonight’s meal. I think this method would be summer friendly too if I use my toaster oven instead of the larger wall oven. 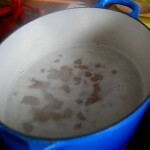 A plus during the summer will be the fact that you’re not standing over a steaming pot, stirring madly for 20 minutes.